The best architects have left marvelous structures in the Czech Republic, including secular and church structures, private and public buildings, decorative and utility facilities, all of monumental as well as minimalist design. The oldest preserved sights of historical interest on the territory of what is today the Czech Republic are linked to the beginnings of the Bohemian state in the early Middle Ages. The Romanesque style spread to Bohemia from the west and the south in connection with the settlement of the country by the Slavic population and with the colonizing activities of newly founded monasteries. Of course, it was adapted to the local environment and natural conditions: Buildings in this style included massive rotundas, simple single-aisle churches, basilicas with arched columnar crypts, solid stone town houses, castle sites and towers. The first walled buildings on the territory of today’s Czech Republic date to the ninth century in what was then the Great Moravian Empire. Rotundas were among the most common church building types, as were simple small oblong churches, and three-aisled basilicas (St. George’s Basilica at Prague Castle, before 920). In the 11th century, the Přemyslid family was relatively successful in unifying Bohemia. They built a loose network of Romanesque castles (the oldest is Primda, 1121); monasteries were built (Benedictine, Johannite, Premonstratensian); churches sprang up with a distinctive two-towered westwork (narthex), and merchants’ houses arched with a cross vault also appeared. The seat of the sovereign Premyslid princes and kings shifted from Vyšehrad to Prague Castle. Around 1170 the Judith Bridge (Juditin most) was built in Prague at roughly the same spot where Charles Bridge (the second-oldest stone bridge in Central Europe) stands today. The Middle Ages were primarily characterized by the wealth and power of the Catholic Church: securely fortified monasteries as spiritual sanctuaries and centers of education as well as arched Gothic cathedrals ingeniously inclined toward heaven, which diverted the attention of the insignificant individual from the burden of earthbound matters. The oldest of these buildings include the monasteries in Osek, Nepomuk and Velehrad (which is an important place of pilgrimage for the Catholic Church to this day). Original Bohemian Gothic developed its own constructional skill resulting in the grandiose spatial compositions of the late period with complex systems of reticulated vaulting (Benedikt Ried). 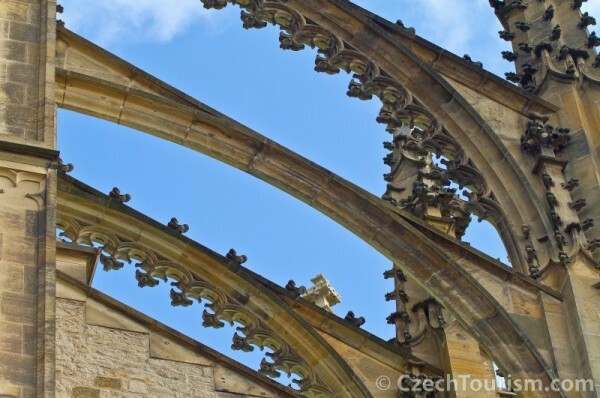 Starting in the 13th century, Gothic architecture influenced the Czech milieu for three whole centuries. Increasingly affluent towns underwent their first reconstruction, and new towns were established based on a large-scale concept. An ever-more influential nobility dominated in the countryside with inaccessible castle complexes. Towns and castles were fortified. In particular, the colonization of the land was systematically carried out by King Otakar II (1252-78). He hired location scouts and founded cities such as České Budějovice, in which the foundations for a future town citizenry were gradually created. Ideal conditions arose for artistic work at the time of the first great expansion of the Bohemian state in the 14th century. With the support of Charles IV in particular (a king who was a sovereign in the grand European style), important building works were also created in the style of High Gothic under the direction of first-rate foreign and local architects(Matthias of Arras, Petr Parléř and others). Prague Castle was restored by Charles IV, the son of John of Luxemburg. In 1356, he drafted the 23-year old Petr Parléř into his service. Parler was an architect of European caliber and, in terms of both culture and building works, Bohemia found its place in the European sun for half a century. After the establishment of New Town, Prague was the biggest European city at that time. In Prague, which was fortified with ramparts, dozens of cloisters (the Emause and Virgin Mary of the Snow cloisters) were built, which made use of the relative safety of the town. Countless churches, stone buildings, a bridge and a cathedral were built. Vyšehrad was also renewed. Outside of Prague, Charles IV had Karlštejn built together with the Chapel of the Holy Cross (kaple sv. Kříže). From this period, the ruined Trosky castle is also a tourist attraction. This is the dominant feature in the landscape and it cannot be missed. The Renaissance brought architecture back to a human scale. A divergence from medieval religious dogmatism and mysticism, with humanist thinking and an emphasis on the power of reason and a return to ancient traditions had a calming influence on structural forms and gave them more balanced proportions, whilst also providing architecture with a lucid, civil order, a new functionality and a feeling for the joyful things of terrestrial life. On its journey north of the Alps from its native Italy, Renaissance art and its authors found an outstanding creative milieu in Bohemia and Moravia, which was rich with investors and builders who were knowledgeable from centuries of gothic constructional craftsmanship. The first Renaissance building in a Czech setting is probably the chateau gate inMoravská Třebová, which dates from 1492, and the Vladislav Hall in Prague Castle from 1493. Prosperous burghers modernized their houses, town halls and purpose-built constructions. In the 16th century, the humanist-educated nobility moved from uncomfortable gothic castles to newly built spacious chateaux with elegant arcade courtyards and geometrically arranged gardens with fountains and statues. Emphasis was placed on comfort, and buildings that were built for entertainment purposes also appeared (ball-game halls, riding halls, summer palaces, orangeries). The beginning of the 17th century brought a new vision of loose shapes to architecture. Under pressure from a return of religious fervor, this developed into a dynamic Baroque style. The drama of material, meaning and spirit in architecture once again faithfully reflected the political situation in Central European society as well as the drama of its ethics and culture. The defeat of reformist Bohemian nobles at the Battle of White Mountain (1620), the Thirty Years and emphatic re-Catholicization was linked to the emigration of leading exponents of Czech culture and the influx of foreign nobles. The great wealth and political power of the Catholic Church and the aristocracy ensuing from confiscations and agricultural enterprise changed the character of the landscape. Nevertheless, Baroque art adapted remarkably to the Czech environment and its scope expanded to take on a new spiritual dimension. Its relationship to the local environment was particularly intensified in the early Baroque phase by Italian building families (Lurago, Orsi, Carlone, Tencalla). For reasons of prestige, rich nobles (the Liechtenstein and Černín families) invited famous architects to the country, whoraised the standard of local architecture (Giovanni Santini, also known as Jan Blažej Santini Aichl); Giovanni Alliprandi and Kilián Ignác Dientzenhofer). The years 1700-50 are associated with a supreme, dynamic, radical Baroque – a version of the style that Czech architects took further than most of Europe. Specific and completely distinctive chapters in Czech Baroque comprise the so-called baroque-gothic, which is exclusively represented by Jan Blažej Santini and rustic Baroque, which even today gives the countryside a distinctive character, particularly in South Bohemia. A typical collection of folk architecture can be found in the village of Holašovice, which is on the list of UNESCO World Heritage sites. The great artistic efforts of high Baroque reverberated in the Czech lands for a long time until after the mid-18th century. This primarily manifested itself in interiors in the miniature shapes of rococo. This was completely subdued by a re-inclination toward classicism. It was first presented through the reconstruction of Prague Castle, and continued all the way up to the mid-19th century, particularly with the construction of chateau summer houses (Kacina ) or large-scale garden complexes with ostentatious garden architecture (the Lednice-Valtice region – the Three Graces in front of the imperial church with a colonnade). The tone of style was indicated by France: imposing chateaux with pillars, theater buildings, colonnades, pavilions, obelisks and triumphal arches were reminiscent of the glory of the ancient world just like the ideas arising out of the French Revolution and imperial Bonapartism. Together with restrained expressions of classicism, early romanticismspread to architecture, which gave expression to an escape from ordinary life to the great outdoors, herdsmen, farmers, history and to exotic lands. With the 19th century, the era of great stylish epochs faded away. At the same time, these became the subject of interest for systematic study by modern architects, and they gave them scope for imitation in new buildings and extensive reconstructions of older works. Romantic historicism primarily drew on English and German models and was progressively inspired by all building styles and combinations of their elements. It left a multitude of buildings in its wake: castles and chateaux rebuilt in the image of enchanting royal seats, town halls, churches, schools, bath houses, guesthouses and entire blocks of town houses. Moreover, the neo-Renaissance style became a means of expression for the Czech National Revival , and a symbol of the nation’s patriotic ability to manage its own affairs in art and politics. Shortly before the end of the 19th century, the Czech milieu adopted the spirit of Art Nouveau from nearby Vienna. Numerous villas and apartment buildings were erected along with prestigious buildings such as the main train station or the Municipal House in Prague.